Predictive typing is a computer term that describes Windows’ psychic abilities. Whenever you type on your Windows 8 tablet, Windows tries to guess what you’re about to type. When Windows feels particularly prescient, it lists the word you’re about to type. It simultaneously places an orange key named Insert on the keyboard. 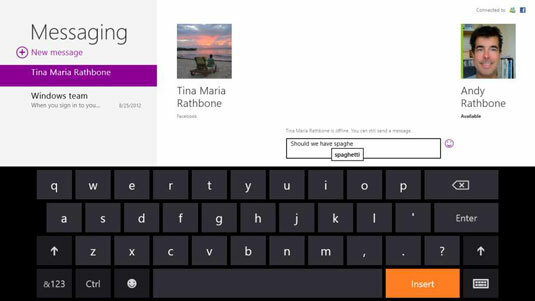 If Windows has guessed correctly, tap the orange Insert key, and Windows fills in the rest of your word. If you notice that Windows has guessed incorrectly, simply ignore the Insert key, and breathe a sigh of relief, knowing that computers won’t be smart enough to overthrow us within our lifetimes. Windows’ accuracy rate differs between individuals. Test it for awhile to determine its accuracy rate for your own typing style. If you’re tying a web address in Internet Explorer, two new keys straddle the spacebar: On the right, you see a .COM key. Tap that to insert .COM, saving you from typing in those four characters. On the left, the backslash key appears, simplifying things when typing in long web addresses. Tap and hold the .COM key, and a pop-up menu appears, letting you choose to insert the .net, .org, .us, or .edu characters, as well. When you type an e-mail address into the Mail app, the keyboard sprouts the .COM key, as well as the @ key, speeding up your e-mail address entry. When typing into the Search field in Microsoft’s Bing search engine, the Enter key transforms into a Search key. Tap that key, and Bing immediately starts its search. Typing in a logon password? If strangers are nearby, tap the keyboard’s Hide Keypress key that appears in the keyboard’s lower-right corner. That prevents the keys from lighting up when tapped, keeping your password safer from prying eyes.